Risk analysis is a fundamental aspect of any business strategy. It involves identifying and assessing events and occurrences that could negatively affect an organization. The goal of risk analysis is to allow organizations to uncover and examine any risks that may be a factor to their operation as a whole, or to individual products, campaigns, projects and future plans. How does media monitoring help with risk analysis? Media monitoring is a major aspect of a modern risk management and analysis strategy. The sheer amount of content created online through blogs, news outlets and social media channels provides organizations with an easily accessible and publicly available source of public opinion and reactions to worldwide events as they unfold. Put simply, media monitoring enables you to keep track of the general reaction to specific events, whether controlled or not, that might impact an organization. There is a wealth of freely available information out there, but it can be challenging to filter through the noise to find what really matters. What are the challenges associated with media monitoring? The main challenge that organizations face when trying to monitor content on the web is the sheer and ever-expanding volume of content being uploaded to the web each and every day. Each company will have specific reasons for mining and monitoring this content and each will have a unique variety of aspects that they are interested in looking at. What’s required is a solution that allows for super specific and flexible search options, allowing for the sourcing of highly relevant content, as it’s published and thus providing intelligent insights, trends and actionable data from this sourced content. How is media monitoring being used? The ability to collect, index and analyze content at scale provides an efficient way to harness publicly available content in order to source and unearth key business insights and trends, that could potentially have adverse affects on a business. Public opinion towards an organization or their employees, products and brands can often be the making (or breaking) of them. Reputations of organizations among the public can often deteriorate over time and it can be crucial to try and spot such trends before they become a serious issue. To achieve this, the continuous monitoring of specific media searches is required. Articles that are in English, contain Samsung in the title, have a negative sentiment and were published between 60 days ago and now. Why negative sentiment? If I’m assessing risk around a certain company, I’ll certainly want to know what they have been up to in recent times, and in particular, any bad press they have been subject to. As we know, bad press usually equates to a negative public perception. The red line in the graph below represents the levels of negative polarity towards Samsung over the past 60 days. It’s clear from this chart that Samsung received some pretty bad press in the month of September, judging by the sharp increase in negative polarity, versus August. Now, of course, we want to know why and whether the root cause of this negativity is going to be a concern or potential risk. Let’s generate a word cloud from our search results to uncover the most commonly used terms from the stories published during this time period. It doesn’t take long to spot some potential causes for concern with battery, batteries, recall, fire, safety and problem all evident. This is a prime example of how targeted searches using the News API can help unearth unforeseen threats or concerns by monitoring public opinion around the entities and events that matter most to your organization. Monitoring and analyzing competitor activity can equip you with a wealth of information and provide hints of strategic movements that can provide you with a competitive advantage in your quest for market dominance. Naturally, competitor activity generates a potential threat to the success of your organization. Just look at Apple and Samsung, for example, where it seems that each action either company takes is carefully scrutinized, analyzed and compared to the other. Samsung were certainly quick to react to Apple’s ‘bendy’ iPhone 6! While it was hard to miss stories about Bendgate in the news, not all stories receive such mainstream attention and could easily be missed if you’re not looking at the relevant channels. By monitoring for mentions of specific organizations, brands, products, people and so on, you can be altered as soon as matching article is published. Not only does this make it easy to keep track of your direct competition, it can also help you keep abreast of general industry goings-on and any murmurs of potential new competitors or industry concerns. With so many factors and variables at play and infinite external influences, no industry is immune to a potential crisis. How individual organizations react to such crises can ultimately decide whether they survive to see the end of it or not. Let’s take a look at one industry in particular that has been coming under recent scrutiny for including unsustainable or environmentally-unfriendly ingredients in many of its products – the cosmetics industry. One such ingredient is palm oil, a substance that has been linked to major issues such as deforestation, habitat degradation, climate change and animal cruelty in the countries where it is produced. As a cosmetics manufacturer who uses palm oil, as many do, the intensifying spotlight on this substance is bound to be of considerable concern. Further analysis can show trends in the likes of social media shares or article length breakdown, either of which could signify a growing emphasis on Palm Oil among the public and media. Looking again at the image above, you can see the number of social shares for this particular story just beneath the title. With access to a world of news content and intelligent insights comes the opportunity for countless analyses and comparisons of trends. As an example, let’s search by category to see if there any noticeable differences or trends emerging from news stories in two separate countries. The category we’ll look at is Electric Cars and the two source countries being analyzed are the UK and Australia. Below we have visual representations of the sentiment levels returned for each search, from the past 30 days. As you can see, the vast majority of stories have been written in a neutral manner. What we’re interested in, however, is the significant difference in the levels of negative sentiment between the two countries around our chosen category. Our results show that the Australian media are perhaps not too keen on the idea of Electric Cars, or perhaps there has been some negative publicity around the topic in recent times. On further inspection, we found that the uptake of electric cars has been extremely low in Australia compared to other countries, with manufacturers citing a lack of government assistance for this. While this may seem like a straightforward comparison, when applied at scale it is this level of analysis that enables risk assessors to spot trends and ultimately improve their decision-making process. By analyzing multiple metrics side by side, interesting trends can emerge. Looking at the comparison below, again between the UK and Australia, it is evident that even in the past two months, the volume of stories relating to electric cars is increasing in Australia, but general interest still lags considerably behind the UK. Business owners and project managers understand who and where potential threats can come from, and therefore have a very defined variety of entities and elements that need to be monitored. Projects that are based in, or focused on, different geographic locations will often pose their own unique threats and challenges. A multi-region project, for example, will require multiple risk assessments as part of the overall risk analysis process. With each project comes a new set of challenges and potential threats. The more an organization can learn about these threats the greater chance they have of reducing the level of risk involved in making certain decisions or strategic moves. Media monitoring provides risk assessors with a wealth of publicly available information, from which intelligent insights, trends and analyses can be drawn. However specific or niche your own search requirements are, with 24/7 worldwide news monitoring backed up by cutting edge Machine Learning and Natural Language Processing technology, our News API can help you with your risk analysis needs. Ready to get started? 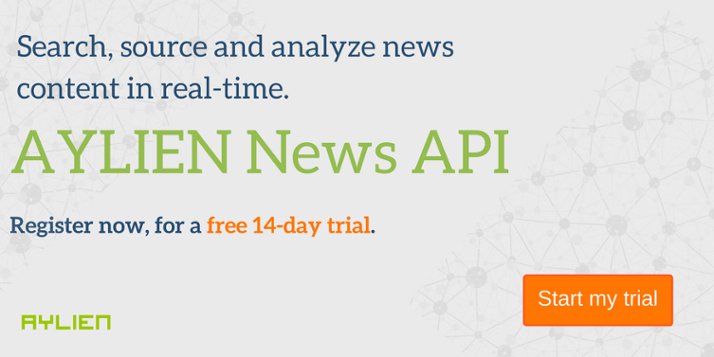 Try the News API free for 14 days and with our Getting Started with the News API guides below, you’ll be up and running in no time.